3) Provide assurance that our communities will stay viable for the long haul. If you or a family member is looking to buy a home in a land lease community, why would you want anything else? Jensen partners with its residents to achieve our interdependent goals. People want a nice, friendly and affordable place to live in their own home and Jensen wants to provide such a place for a fair profit. Everyone wants to enjoy pride in ownership as well as at least steady and over the long term appreciating property values. This year more than most, we are all happy to have a roof over our heads and bright prospects for the future. Better times are on their way but Jensen communities aims to be there for its customers through thick and thin. 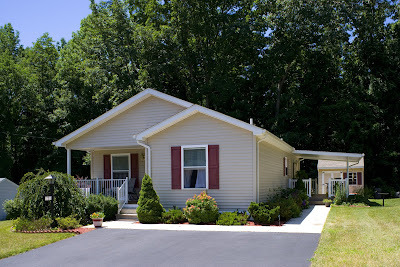 We offer an affordable option to live in your own home in some great neighborhoods. We hope that you will visit one of our communities to see how you can "Get in on the Good Life!" In the spirit of the holiday season, we hope that you enjoy the comfort of family and friends, but remember those less fortunate with a toy or food donation with so many in need. Lowering monthly expenses is on everyone’s minds these days. A dollar we don’t have to pay for electric, gas or oil each month is a dollar we can use to pay down credit card bills, the mortgage, or into our bank account. Buying a new Energy Star Home complete with Energy Star rated appliances reduces your monthly expenses below that of comparable homes and appliances. In fact, buying an Energy Star home may even qualify you for a larger home and mortgage due to the expected lower expenses. And once you have made the modest upfront investment, and energy efficient home is the gift to your family that keeps on giving every month and every year you own the home. 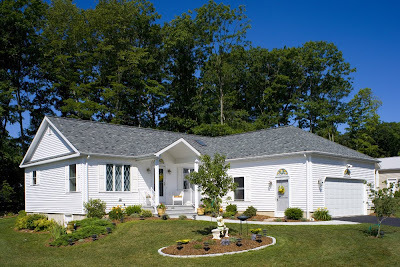 So besides the money you can save with an Energy Star Home, you get the added comfort of a tightly built house. 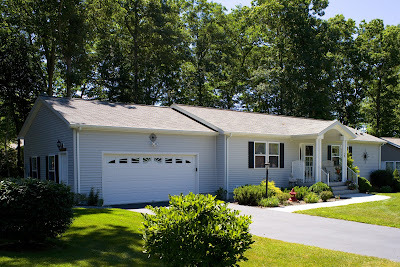 More information on Energy Star (including New Homes, Home Improvements, and Products can be found at: www.energystar.gov. Have you seen the TV advertisement with the family literally sitting on the fence and the little girl saying, "Mommy I want one"? For those who have been sitting on the fence waiting for the "bottom", their wait may be over. Although no one would say we are completely out of trouble, it is a great time to buy if you are confidently in a position to do so. With a strong equity position and secure source of income, what better time to purchase a first or second home than right now with interest rates as low as they may ever be and home prices at their lowest levels in years? 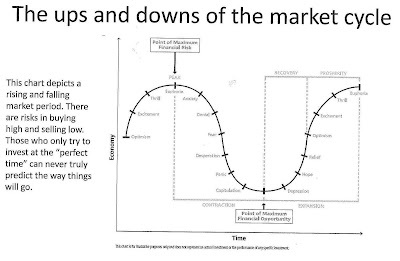 Some might say that they will wait until the market actually bottoms out but history will show that most people buy on the upswing when the market has already started its upward climb. If you are planning to buy, use, and hold the property for at least five years, it should be better to buy as close to the bottom as possible and take advantage of today's low rates and prices. Sellers are more eager than even six months ago to make a deal. Thoughtfully consider your reasons to purchase a new or additional property. Make sure you would buy the property regardless of whether or not it may appreciate. Take a sober and realistic look at your resources. And then armed with rational reasons and the steam to back it up, jump right off of that fence and make the deal of a lifetime! "Get in on the Good Life!" 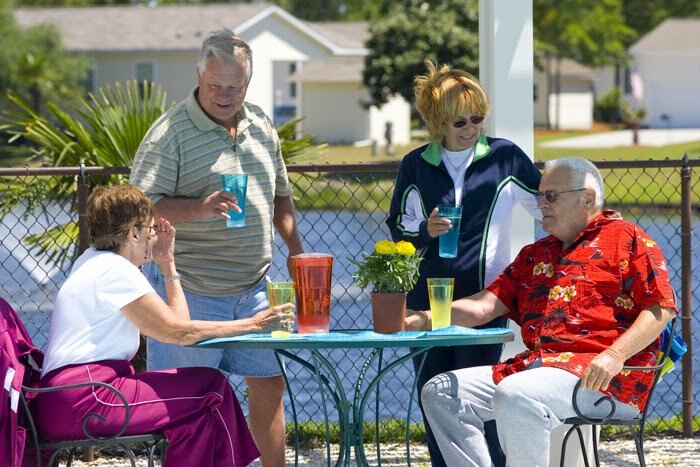 Pride in ownership is what sets a Jensen community apart from other manufactured housing land lease communities. We pride ourselves on distinctive entrances with clear signage and colorful plantings. All common areas in each community from New Hampshire to Georgia show regular attention to detail. Our clubhouses receive regular updating and even replacement as is the case with our new Community Building at Crestwood in Concord NH. People move to a Jensen community because they see the pride in ownership. 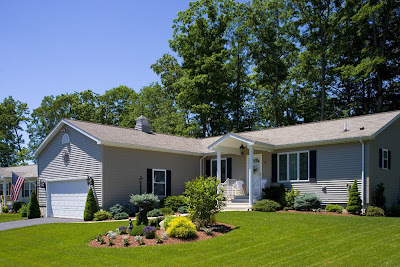 Resident's take both pride in their homes and yards. Green thumbs abound! Drive through any Jensen community to see how well kept they are. Special gardens, patios, decks, and plantings make each home distinctive. It is great to have your own yard as long as you don't have too much to maintain! Community rules and regulations help to ensure that everyone is on "the same page" when it comes to upkeep. 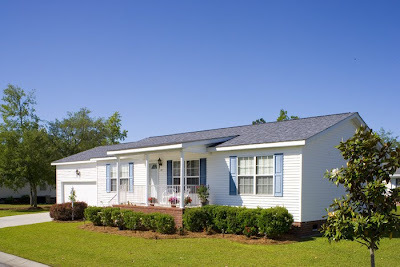 By knowing what is expected, all residents can enjoy a nice, peaceful, quiet and safe neighborhood. As you look for a new home and place to live, consider the pride of ownership of your propective neighbors as well as the developer or community manager. No Time to Test the Market! Selling a home or other property in today's market takes a dose of reality and commitment. The dose of reality comes in the form of the selling price. If the seller is not facing the reality of Fair Market Value the likelihood of a sales happening is slim to none. FMV means what a willing buyer and willing seller agree to in a free market. Until a sale has been consummated, we are talking about an estimate of FMV. Actual FMV is only determined once the sale goes through. No on likes to see how their home has lost value from the peak. And if we don't want to sell, then we don't have to face it. If we do want (or need) to sell, then we need to face reality or face months or years of being frustrated without a sale. If we are not committed to selling at FMV, leave the property off of the market. A qualified appraiser using relevant comparables can perhaps provide a better FMV than most agents who are motivated by obtaining a listing. Spend the $300, it will probably save you money in the long run. If you don't want to spend the money, talk to at least three qualified agents who have had success selling in the current market. This is no time to test the market. Loosing the initial month or two with an over priced property thinking that coming down after you have lost all interested buyers is no way to sell in today's market. A Great Time to Buy a Home! •A market which has more sellers than buyers. •Low prices result from this excess of supply over demand. •Also called a soft market. Obviously if people had more confidence in their income and equity, homes would be selling at a fast and furious pace until demand caught up with the supply. Buyers need to consider their own comfort level and confidence in their "means". But, if you have been sitting on the sidelines waiting for a better deal please consider that the combination of choice, price, interest rates, and seller incentives may not get much better. And if you have not owned a home for the past three years, you should be eligible for the Federal Tax Credit which will expire by year end. Have a house to sell and don't want to jump out of the frying pan and into the fire? I don't blame you! We all need to buy a house well within our means. Seriously consider how you can rightsize into a better home and community. 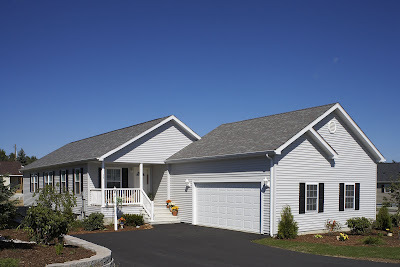 Small manageable homes have always been in fashion at Jensen communities. And although they may be smaller, they are big on comfort, efficiency, and as carefree as a home can get. The planned simplicity in floor plans meets the needs of those looking to rightsize their lives in a safe and friendly neighborhood setting. It is time to get off of the fence and get looking at the great homes on the market! For those who have not owned a home within the last three years, have some equity and are confident of their income source(s), this provides an additional reason to buy now to take advantage of the great home prices, low mortgage rates and this tax credit. You should of course consult with your advisers to understand how you go about ensuring the credit. The sobering message that now President Barack Obama delivered last week asked us all to take more personal responsibility. This message should hit home hardest in the real estate and financial sectors. Personal responsibility should mean that we live within our personal resources. With all that happened in 2008, we get to redefine how we look at our homes and finances in 2009 and beyond. We can choose to live on the edge or we can choose to be edgy and follow a different path. This path can most certainly be better than spending money on things that we don't really need. The real challenge is to define our own standards in relation to our means. With personal responsibility comes personal freedom. Why get tied down to a house with high monthly expenses? 2009 will undoubtedly go down in history as a belt tightening year. Buying a home and making a change to a less costly house could be one of the best moves you make for your financial future. 2009 will be one of the best years to buy a home in history with low borrowing rates and dropping prices. Get In on the Good Life! Jensen communities provides the best quality of life in your own home. There are very few places today that people can choose to live well within their means. Perhaps the McMansion craze is over due to this wonderful economy but the fallout will appearantly be felt for years to come. Home prices and square footage increased to the point where it became hard to truly downsize or rightsize to a home within one's means in retirement (or just when the nest is empty so one can better prepare for retirement). A bigger, more expensive home with an unaffordable mortgage does not lead to financial freedom. A home paid for (or mostly paid for) with equity from one's present home or savings can provide more personal freedom and peace of mind. My Grandfather liked to say "that a loan well made, was a loan half paid". He was obviously not a fan of "no money down" home purchases and we have stuck to his wisdom these many years later. The troubled economy has created tremendous house buying opportunities. Define your own standard and sense of financial freedom. Get in on the Good Life! (TM) in a house within your means.